You are here: Home / Ent. / Did Prince Free The Slaves? Did Prince Free The Slaves? (ThyBlackMan.com) Amidst the questions, the “controversy” and the shock surrounding the death of music icon Prince, there are several issues that should be of concern to the African American community. We could talk about Prince’s alleged return to drug use and why. We could talk about his connection to the Illuminati. We could talk about the irony that Prince and Vanity died a few months apart at the exact same age. Or we could even talk about how he went against Sony just like Michael Jackson did – and they both ended up dead in their 50s. There is proof for all of this but that is an article for another time. Why do I ask if Prince freed the slaves? Because the focus of our people on Prince has overshadowed the fact that Harriett Tubman will be on the $20 bill beginning in 2020. That is monumental and bigger than the death of Prince, or it should be. An African American has never been recognized as important enough to be placed on the front of U.S. currency in the history of this country. We have not been given a dime of reparations for slavery. So many of our people have died on plantations, in prisons and in police custody. Others have been defamed, degraded and assassinated. In the aftermath of Michael Brown, Jordan Davis, Trayvon Martin, Sandra Bland, Eric Garner, Freddie Gray and so many others, we have to stop and acknowledge that a wind of change is coming, a wind that needs momentum with as much focus as we can place on it. But what are many of our people doing instead? Focusing on an entertainer above all else. Even with Maya Angelou, too many of our people remember her poetry while too few people focus on her accomplishments for the rights of our people and our struggle. Again a focus on entertainment. I am not attempting to diminish the extraordinary talent and creativity of Prince, but Harriet Tubman should be the role model on deck. The fact that Prince is being focused on more than Tubman is a reflection of the African American infatuation with entertainment and entertainers, an infatuation that wrongly overshadows many other things. We flipped out over Cosby, but he is an entertainer. People cried and stood speechless over Michael Jackson, but he was an entertainer. We act as if Oprah walks on water but she is a TV talk show hostess with a magazine, a poor sense of spirituality and a failed pseudo-relationship, though she has helped many people. The African American community has far too much focus on entertainment. Our people will camp out all night to get Beyonce tickets but try to get those same people to watch a Presidential debate that impacts their future and you will see what I mean. Our people are using sports and entertainment as a coping mechanism, a way of escape from the stress and strain of life. But in doing so, we are not prioritizing the right things. Our youth look up to bling bling entertainers instead of people like Harriet Tubman. What type role models are we creating today? Prince? African Americans want to be entertained in church from the pulpit to the choir or “we” feel like church has not taken place. Too many of our people rely on the beat of the music instead of feeding our intellect and building our minds. Too many of our people are still slaves in denial, the very type people who fought against heroes like Harriet Tubman. Thus to them, Prince is a bigger deal because they cannot relate to freedom from slavery. Yet neither the music industry nor the sports industry are controlled by us. Our people are simply paid pawns for the handlers to make and keep the real money. Sing for Mr. Charlie. Dance for Mr. Charlie. Shoot the ball for Mr. Charlie. Play into the stereotypes and Mr. Charlie will pay you well. But our focus must be on real independence, not on distractions. So now in context, I ask you did Prince free the slaves? Entertainment and entertainers must not be the focus of our community. Our young boys sag their pants because they follow entertainers. Our young girls dress like they have no respect for themselves because they emulate women like Nikki Mirage, Kim KarTrashian and Beyonce – all entertainers. Where are our priorities? It is time to realize who and where the slaves are, what is keeping slavery in place and how to end slavery in the minds of the African American people. Some say music can do this. But I doubt music that stereotypes us, promotes promiscuity, emasculates our men and objectifies our women can ever set us free. Wake up. THERE IS A COVER UP GOING ON REGARDING PRINCE!!! They are hiding something. As a former detective, I have learned the real answers are often found in what you don’t hear, what is not being asked and what is not being seen. Prince’s sister hurried up and cremated his body – a move to likely prevent any more evidence from coming out through further testing. It is also very strange that a man who was so rich and who gave to so many people or charities secretly would not have a Will – especially when Prince was about ownership of all that he built and created. More perplexing is the fact that they say opioids were found with Prince and in his house but they are not saying the name of the medication. The name of the medication would tell us what it was used for and thus what he was really suffering from. We also know from doctors that Opioids can actually increase the very pain the person was trying to avoid – so why take them? THERE IS A MAJOR COVER UP, its odd that nobody is mentioning that Vanity died just 2 months earlier at the exact same age. It’s also odd that nobody is mentioning April 19th-May 1st is the 13 days of ritual sacrifice according to the satanic calendar. Look at the date when Prince died. jdean you are asleep to even put Prince a class with Harriet Tubman. Prince was an androgynous, emasculated entertainer who objectified lust and women in his music. Without people like Tubman, you would still be on the physical plantation so shake off the mental plantation. Entertainers should not be seen as role models. Your priorities are all wrong and I am glad many people disagree with you. Jdean you represent those people who are still asleep and bound by mental slavery. MLK will be on the back of the $5 bill but I guess that’s all symbolic to you too because you don’t overstand that progress is a very slow process. Wake up. Prince double crossed the Illuminati and Sony. And just like Michael Jackson who did the same, he is dead. Harriet tubman on a dollar bill is a symbolic victory but really means nothing to our plight. Prince affected so many current lives. What do you want us to do for our superstars, not mourn. We have a slave on the bill and she will share it with the slave owner Andrew Jackson so what did we accomplish? Baby step my friend but we cannot ignore that Tubman on the front is progress. Is it enough for what our people have been through? No. But is it a start? Yes and we should not diminish that. Prince was a man/woman who made perverted music as well. In the end his lifestyle caught up with him – the perversion, drugs etc. Don’t forget that side of the coin. And a person speaking out or giving money does not a great role model make. Prince did more than entertain. 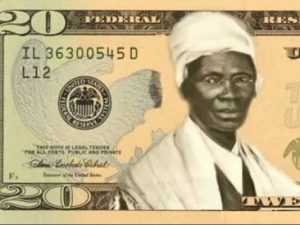 Even though I agree there should be more emphasis placed on Harriet Tubman and the profound move to put her on the $20 bill, in the eyes of many, it’s still just a $20 bill (and a move to appease some people without really dealing with current issues). Prince has done more than just entertain and display his artistry – which he managed to do for the good part of 40 years, an honorable accomplishment by itself alone.